Instead of buying a single knife, it’s often better to buy knife set. 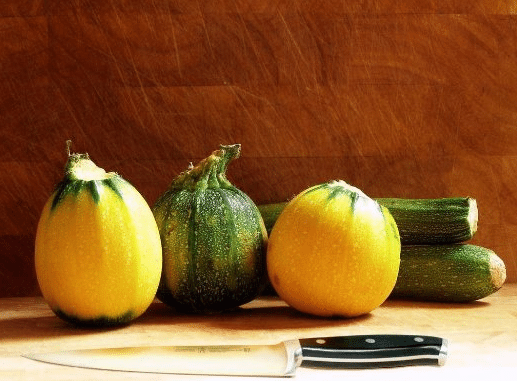 When you buy a set, you’ll receive several knives that can be used for anything from cutting vegetables to paring and cutting bread. But, what is the right Zwilling J.A. Henckels set to buy? It really depends on your needs, and we’re here to help you. If you landed on our site, you know that we love to review and test new knives to see which are the best. 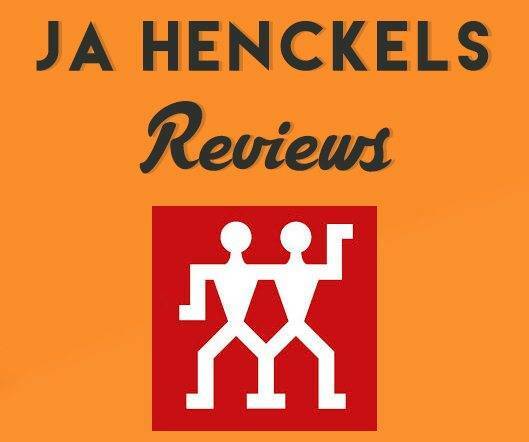 We tested the top knives that JA Henckels has to offer and are going to provide a hands-on review of each of the sets we had the pleasure of testing out for ourselves. Join us as we review three of our favorite J.A. 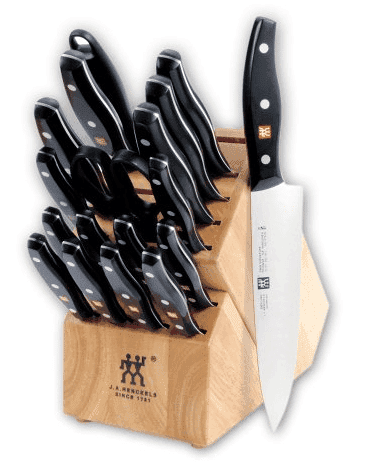 Henckels knife sets. There are 19 pieces included in this set, which makes it a remarkable choice. You’ll have virtually every knife you can think of at your disposal, and a cutting block is included for your convenience. Made in Germany, these are some of the highest quality knives you’ll find. These knives feature ice hardened blades. When blades are forged in this matter, they’re more durable and long-lasting. You’ll immediately notice that the blades stay sharper for longer and will hold their edge as a result of being ice hardened. All of the blades feature a three-riveted design. This is where the blade and handle are secured together. But, you’ll also notice that a full tang is used with these knives. This allows for greater durability and balance when cutting. As a chef, you’ll want the best balance possible with your knives, and this is what the set offers. So, which knives are included with the set? Rounding out the set, you’ll also receive a sharpening steel, shears and a bamboo storage block. All of these knives are backed by a lifetime warranty and hold their edge exceptionally well. The balance on these knives is perfect. You’ll notice when cutting that you’ll apply less force and pressure while the knife glides through your food. I was surprised when one of these knives grazed against my finger and left a cut behind. They are razor-sharp, so be careful when using them. The manufacturer also recommends not putting these knives in the dishwasher because they will dull faster. This is the perfect example of a high quality knife set. It includes virtually every knife you could possibly want, and a bamboo block is also included, which will protect your knife from dulling. And, you’ll also receive a sharpening steel, shears and an 18 piece hardwood block to store your knives away safely. Balance is provided with the full tang design. This allows the blade and handle to be attached when the knife is forged. Ultimately, this adds to the strength of the knife and its balance. When you cut through a hard substance, such as a bone, you won’t need to worry about the knife breaking where the handle meets the blade. And, a three riveted design is provided on the handle for the utmost in craftsmanship. All blades have a satin finish in stainless steel to allow for precise cutting and a sharp edge at all times. It’s important to note that while these blades say that they were made in Germany, when you look at the blades themselves, they state that they are made in China. I believe this is an error in the product description, but that doesn’t take away from the quality of these knives. 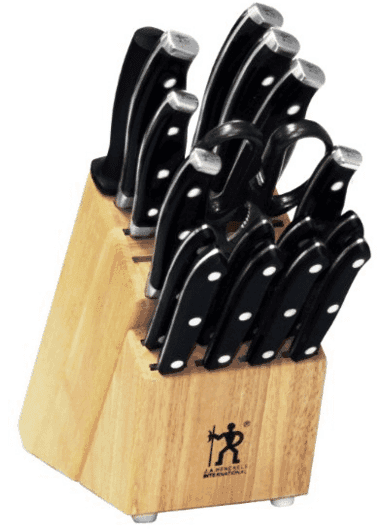 While I still prefer the first Zwilling set I reviewed because of the bamboo block and the diversity of knives provided, this is still an amazing knife set that is far cheaper than its true value. I was so surprised by the quality of these knives when I used them, I wanted to see what others were saying. What can others possibly find wrong with this knife set? The knife block is not optimized and does seem a little bit crowded at times. Not really made in Germany. When I did try to sharpen these knives, I noticed that the steel sharpener wasn’t up to the standards that I’m used to, so I did use a different sharpener after the first time. Is this a deal breaker? Absolutely not. For an affordable, quality knife set I highly recommend the Premio. 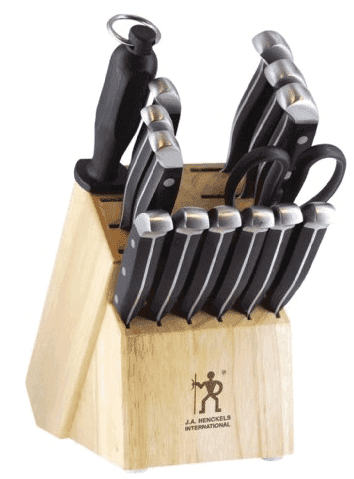 The International Statement 15 piece knife set is the most affordable on our list, and offers many of the same great features as that the other sets listed above. We really liked the block design of this model because it’s highly optimized and makes it easy to fit all your knives in the appropriate place without awkward arrangements. But, you’re here for knife reviews and not a detailed description of the block itself. Stain and rust resistant, the stainless steel blades feature a black polypropylene handle with a triple riveted, ergonomic design. All of the blades also feature a full tang. So, which knives are included in the set? 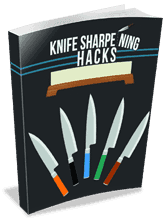 As with all of the sets we’ve mentioned, you’ll also receive a sharpening steel, shears and a hardwood block to store your knives. While the blade is one piece of metal all the way to the handle, these knives do not feature a forged bolster, which is needed for added safety. However, these knives are so affordable that they had to be on our list. They still feature the same great quality that JA Henckels is known for, but they’re not as durable and versatile as the first Zwilling set mentioned earlier. Each of these sets have a place in your kitchen. We listed all the sets by their price so that if the Zwilling is out of your price range, you’re sure to find one set that will work perfectly for your needs. Keep in mind that the Zwilling is more expensive than its counterparts, but has a better balance and is far more versatility than the other sets we mentioned. But, all sets are made by the same manufacturer and feature a full tang design, which is unusual for the lower-end knife sets on our list. You can’t go wrong with any of the sets, and we recommend them all after giving them a thorough, hands-on review.